YU Yutopia was launched on 17th December, 2015 exclusively on Amazon India for a price of ₹24,999. It was available with a bunch of offers which includes flat ₹1000 Cashback on SBI Credit Cards. 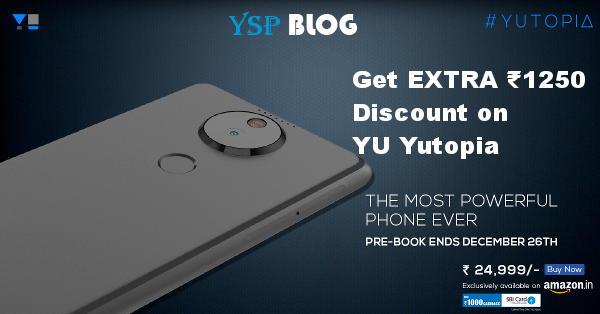 If all the above offers aren't enough we are here to provide you a way to get an extra ₹1250 discount on Yutopia (5% Discount). If you're planning to buy Yutopia below is the way to save some extra money. 1. Login to acc1 and go this page on Amazon: Buy Gift Card Here and order a gift voucher worth ₹10,000 (gift card limit) for your original account and use coupon code EMAILGC5 to get the dicount. 1. One code can be used only once by a customer on one account that's why you need three different accounts. 2. The Offer is only valid from 26th December, 2015 to 10th January, 2016 (both days inclusive). 3. The offer is valid only on Amazon.in Email Gift Cards, and other formats like greeting card, gift boxes and multipacks listed on this Gift Cards page. 4. It is not valid on Top-up Your Gift Card balance.